Corona Insights is honored to have received a Gold Peak Award for our market research work to inform the University of Denver Sturm College of Law’s strategic plan. This award recognizes both Corona’s quality research skills, as well as the positive outcomes of data-driven decision making. The event was held at the ever-changing Museum of Contemporary Art. Several members of the Corona team were present to accept this award. An extra congratulations to some past Corona customers and familiar faces who received awards this year: Iliff School of Theology and The Space Foundation. 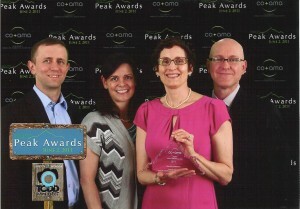 Click here to read about Corona’s Silver Peak award last year for our rebranding.